Dang!!! Was that on public land? What did it score? What’s the story on this beast? More photos please. buck eas taken on public land in southwestern colorado. its amazing! amd I would love to hear more on this buck! This is a fake and those that posted it knows its fake. 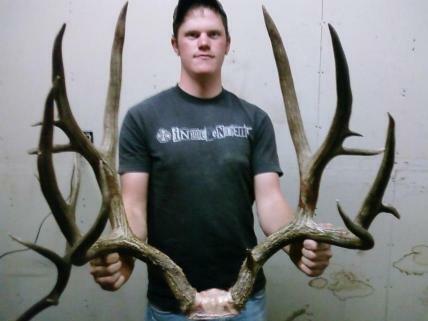 This kid made these horns and has been trying to convince folks it is a legit buck he killed. Nice try slapnut! i also think its fake. if it was real then get a pic of his body with the antlers on it! anyone who thinks that big bucks posted on here are fake, grow up. ya’ll are just jealous. there are plenty of places on public land that produce big bucks. its called scouting and going where no one else goes. thats where big bucks live. Any hunter would automatically notice the blood on the horns and know they are real! Well Tuffy!!! Why doesn’t the hunter in the pic end all the debate and either show some pics of the horns on the head or fess up to them being made? Surely you have more pics than just that one of a buck that nice…. I make these cast of antlers, and the red you see on the skull cap is the jell used to keep it from sticking to the moled. If i was to guess it is a real nice set of cast. is just one nice set . And if you no how to cast antles please paint or bleach the skull cap like i said nice set and i hope you get one more like this one . There is a elk horn on the left hand side in the picture. It looks like trash but you can see the third on the elk horn. And he is holding it out quite aways. But still a nice deer. 210" gross ??? all you haters need to shut your mouth! awesome deer dude don’t these wanna be’s take that away from you. This buck is not fake. It was killed on a ranch that I guide on. A true monster.